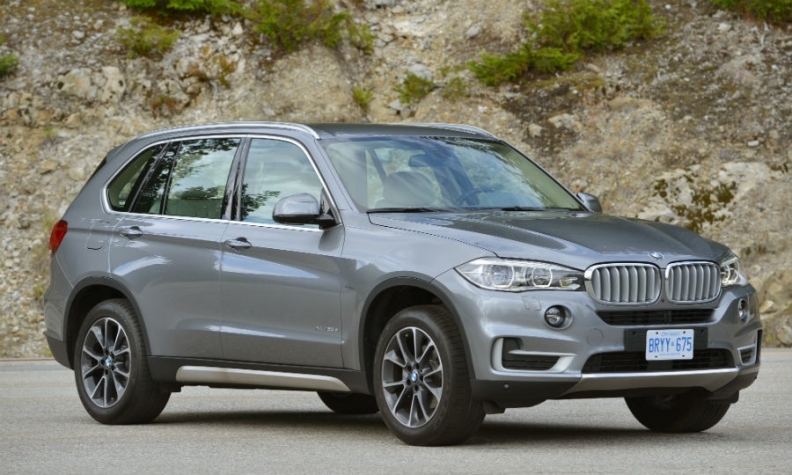 Surging sales of the X5, shown, helped to boost BMW's first-quarter results. MUNICH -- BMW reported a 21 percent jump in first-quarter profit on stronger demand in the U.S. and Europe for models such as the X5 SUV. Earnings before interest and taxes increased to 2.52 billion euros ($2.83 billion) from 2.09 billion euros a year earlier, BMW said today in a statement. Revenue jumped 15 percent to 20.9 billion euros. BMW said its automotive EBIT margin was 9.5 percent in the quarter, remaining at a similar level to the year-earlier quarter and at the upper end of its target range of between 8 percent and 10 percent, thanks to record sales of high-margin SUVs in the quarter. By contrast, the quarterly return on sales from ongoing business at Daimler's Mercedes-Benz Cars jumped to 9.2 percent from 7 percent a year ago, while Audi's operating margin slipped to 9.7 percent from 10.1 percent. BMW reiterated it expected record sales and profit before tax this year thanks to a the launch of 15 new or upgraded Rolls-Royce, Mini and BMW models, including the BMW 2-series Gran Tourer seven-seat compact minivan and a revamped version of the top-of-the-line 7-series sedan. Automotive segment revenues are forecast to grow "significantly" due to the increase in sales volume and exchange rate factors, BMW said. The company had previously expected a "solid" growth in revenues. BMW however cautioned that some regions continue to be difficult. "The situation on the Russian automobile market, for instance, is likely to remain difficult. The ongoing process of normalization of the Chinese automobile market is also likely to continue, resulting in less dynamic growth," BMW said. Download BMW Q1 report as a PDF, above right. First-quarter BMW brand sales were up 5.4 percent at 451,576 cars, BMW said, citing continued growth in Europe, North America and China and a 30 percent jump in deliveries of the X5. Sales of Mini brand cars rose 29 percent to a record 74,312, helped by a new-generation three-door hatchback and the brand's first five-door car. Rolls-Royce had its second-best first-quarter sales to date, with volume rising by 13 percent to 781, boosted by sales of the Ghost sedan. BMW joins fellow German carmakers Volkswagen and Daimler in reporting higher first-quarter earnings estimates as more customers buy up-market vehicles, and Europe’s auto market revives. Industry executives are betting that growth in the region and the U.S., where sales have risen for 60 straight months, will make up for a slowing Chinese economy that has prompted BMW to reduce production and cut prices.